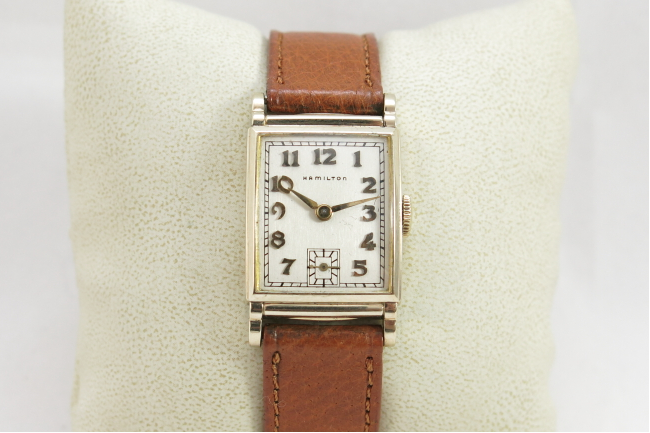 In 1948 Hamilton introduced the Eaton and it's a very classic looking tank-style watch. It was produced for four years and it's production run ended in 1951. Although the styling of the Eaton is clean and sharp, it's actually a super-small watch. By today's standards it's better suited to being a woman's watch. It takes a 16mm strap so you can tell from the strap that this watch is only about 20mm wide. The 10K gold filled case feels very solid and can show wear through to the edges of the bezel and lugs. 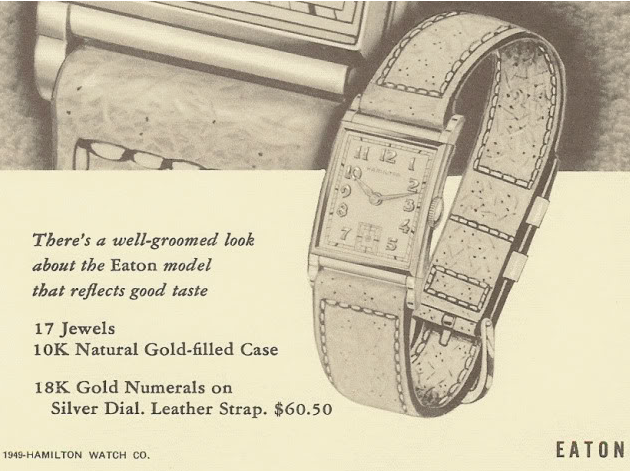 Only an AGN dial was offered with the Eaton. Under the dial you'll find a 17 jewel, 14/0 sized 980 movement. I've had several Eatons over time - I guess I forget how small they are, but they do look very nice. I purchased an Eaton a while back on one of those auctions with a photo from two feet away. I was shocked to find that it was essentially new old stock and appeared to have never been worn!